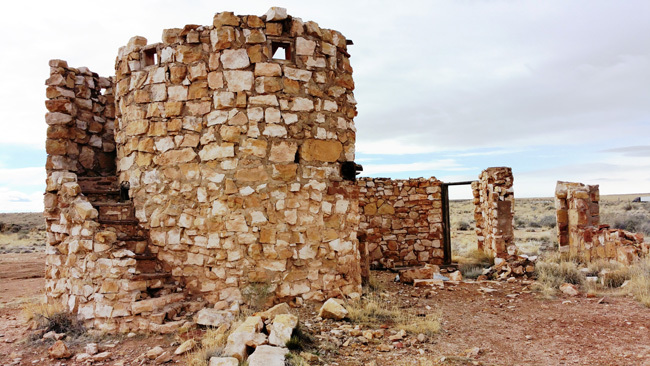 After exploring the ruins of Twin Arrows Trading Post, I wanted to explore a few places north of Flagstaff, but the access roads were closed due to the previous night's snow storm. I hadn't realized how treacherous the February weather in Northern Arizona could be. 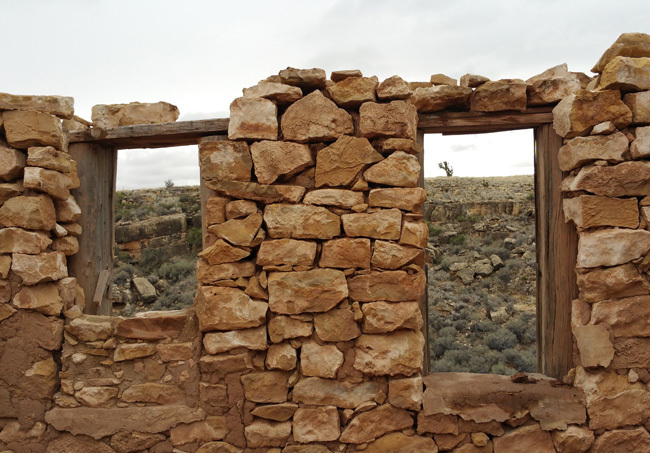 I continued along Route 66 to Two Guns, a sprawling piece of land with ruins of countless stone buildings. Two Guns is a "three for the price of one" site. 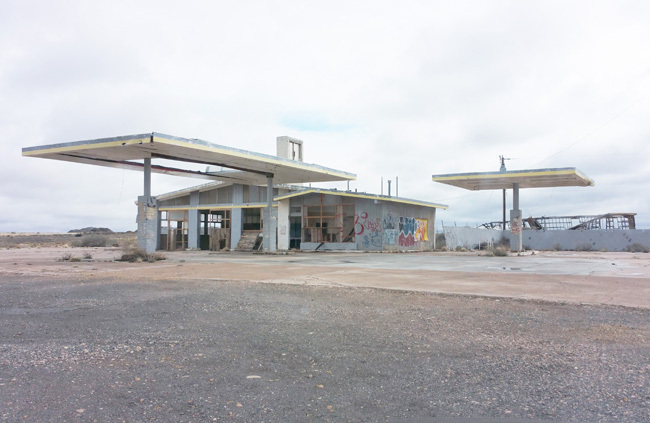 On the neighboring lot is an abandoned KOA campground and gas station. 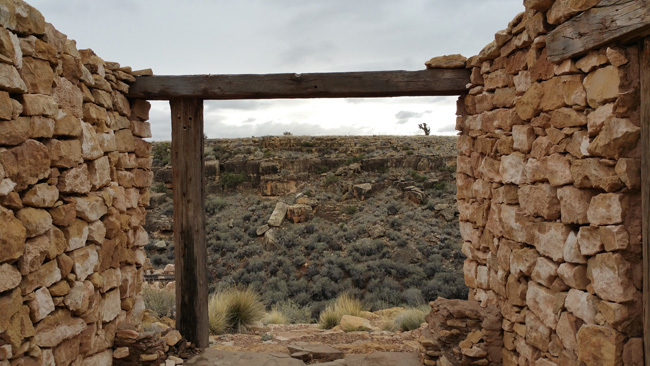 Perhaps most interesting of all is a hidden cave with such a brutal history that many consider the entire area to be cursed. Indeed the place has known its share of tragic deaths, fires, and financial misfortune. 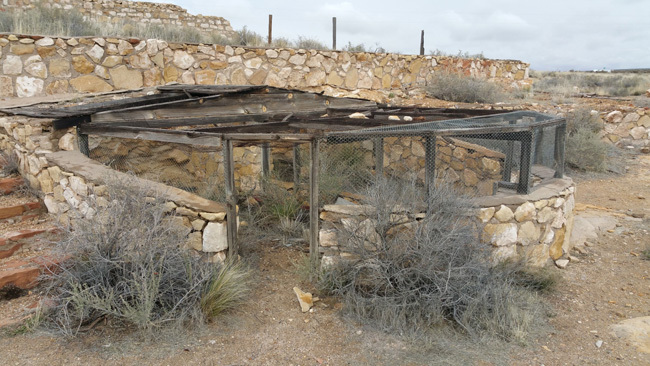 Apache Death Cave is hidden near the outskirts of Two Guns, not far from the abandoned campground. The story behind it is quite brutal. 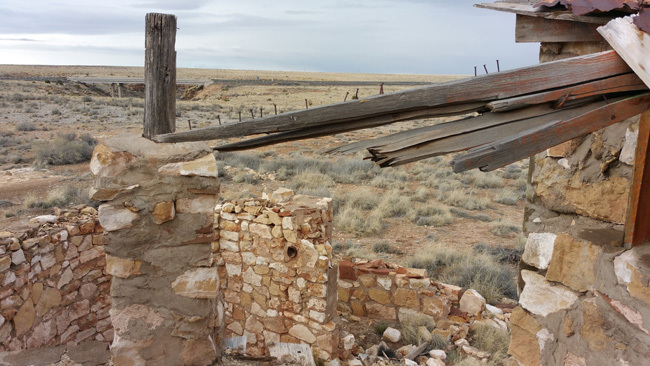 In 1878 Apaches raided two Navajo camps along the Little Colorado River, plundering their food and supplies and killing everyone except for three girls, whom they kidnapped. 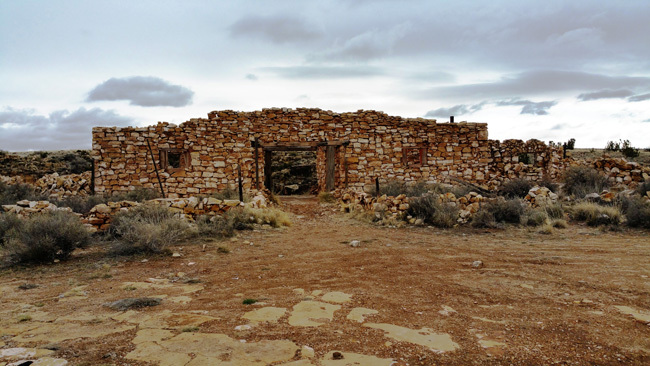 Twenty-five Navajo men rode out in pursuit, but the Apache managed to slip away. 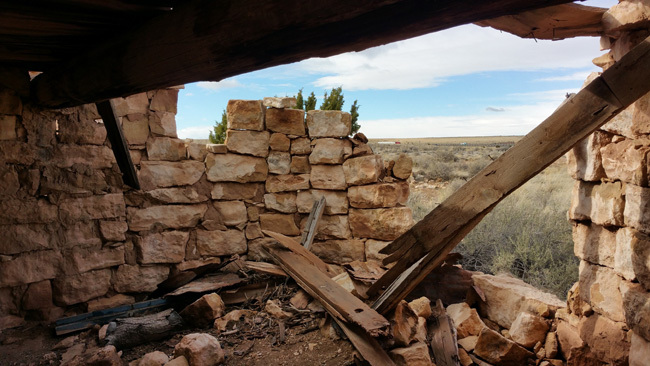 While attempting to track the raiders, Navajo scouts noticed warm air and voices coming from a fissure in the ground. 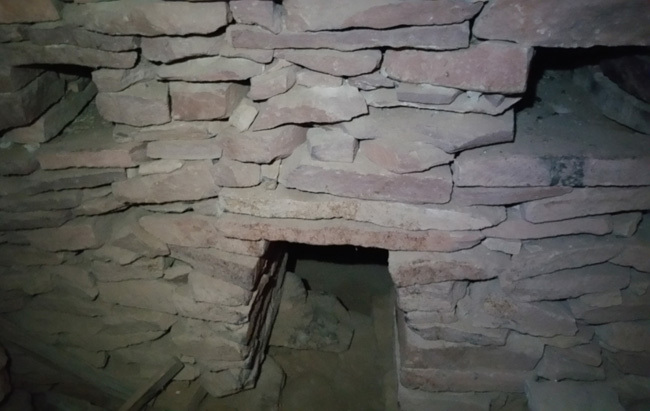 They had discovered the cave where the Apaches were hiding, along with their horses and stolen goods. 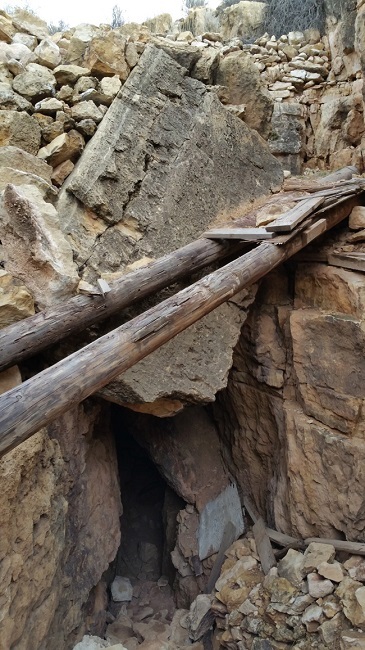 The Navajo warriors found the mouth of the cave, which was hidden in a ravine. They killed the two guards, then dropped wood into the ravine and lit a fire. 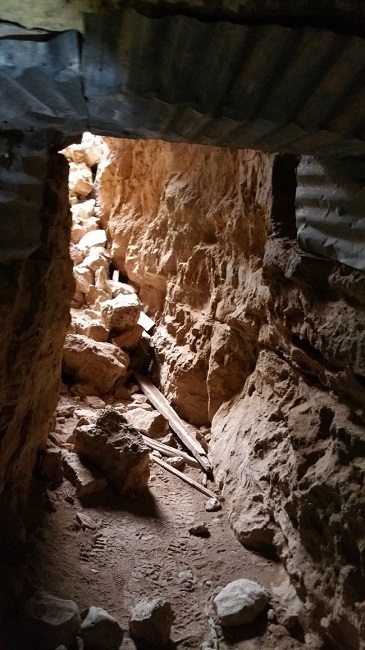 With smoke billowing into the cave, the Apaches were trapped. 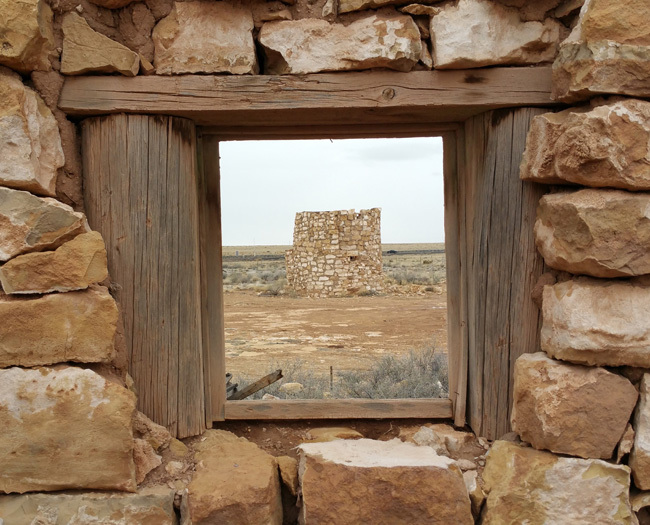 Those who tried to escape were shot by the waiting Navajo. 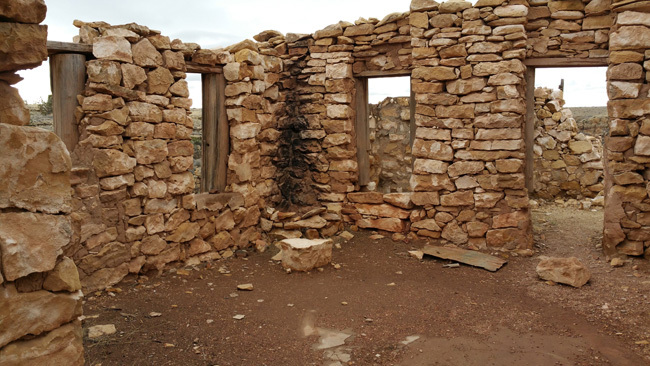 One Apache tried to bargain for their lives, but when it was revealed that they had already killed the three girls they abducted, the Navajo decided the Apache had to die. The men trapped in the cave used what little water they had to douse the fire, but it wasn't enough. In desperation they killed their horses and tried to put out the fire with blood. When that failed, they attempted to seal off the entrance by stacking the horse corpses. But with the Navajo relentlessly stoking the fire, they were doomed. 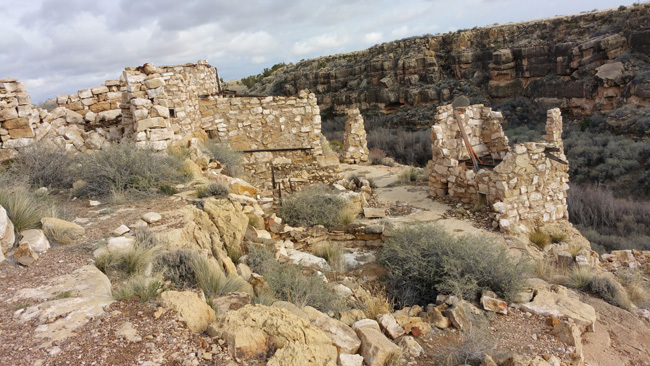 Smoke rose from the fissure the scouts had discovered, carrying the voices of the Apache as they sang death chants. 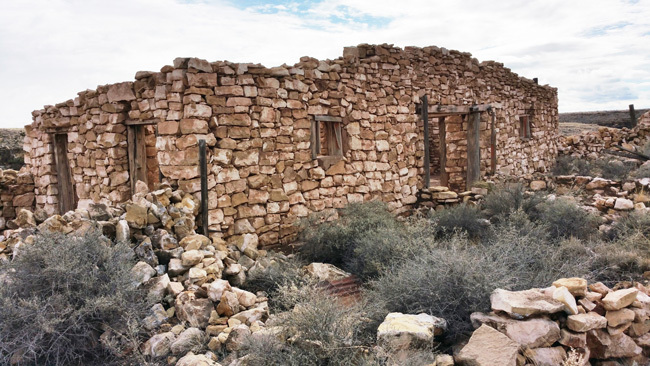 The next day, after the cave had cooled down, the Navajo went inside to discover piles of charred horse flesh and the corpses of the 42 Apache warriors who had asphyxiated. They reclaimed the stolen goods and valuables and quickly rode away. 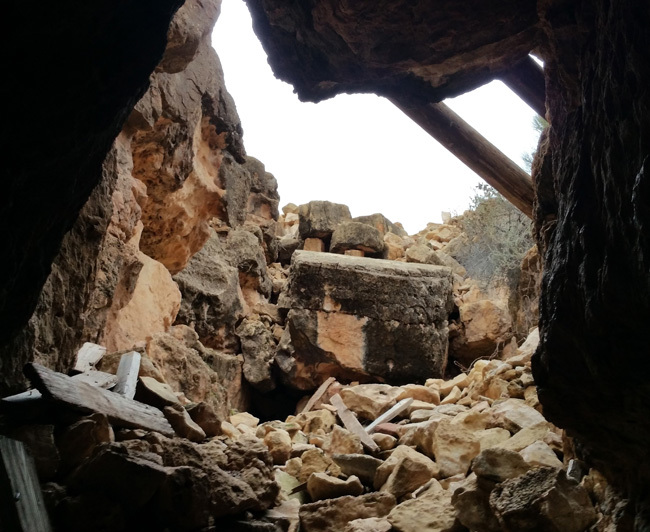 From that point on, local tribes have avoided the cave, considering it and the surrounding land to be cursed. 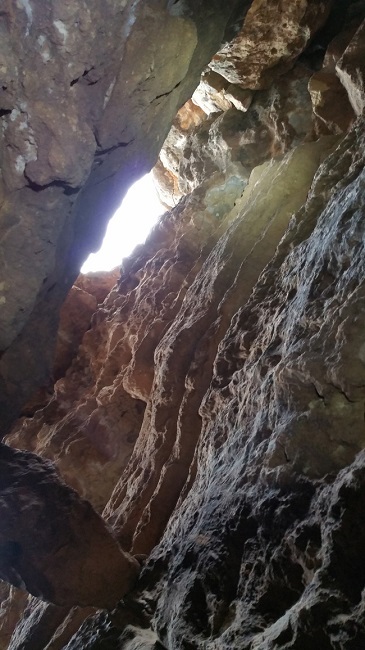 I explored the cave, following it as far as I could go until it became extremely narrow. By then I'd seen enough and didn't think squeezing through the tight space was a very good idea. I later read that the cave system goes on for miles, but rock slides have made much of it inaccessible. 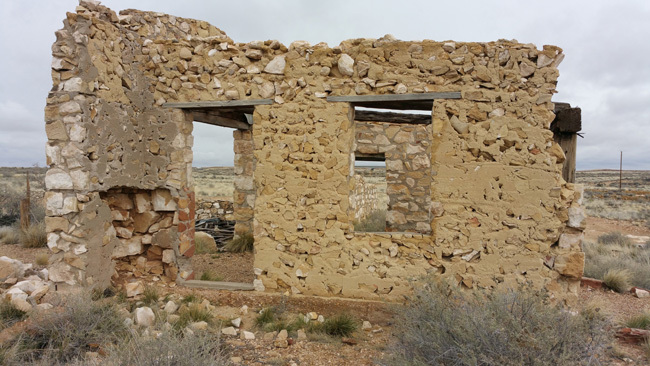 Two Guns has the look of a historic landmark, but without any plaques or signs to indicate what the buildings were used for. Rusty segments of barbed wire impotently line the road. 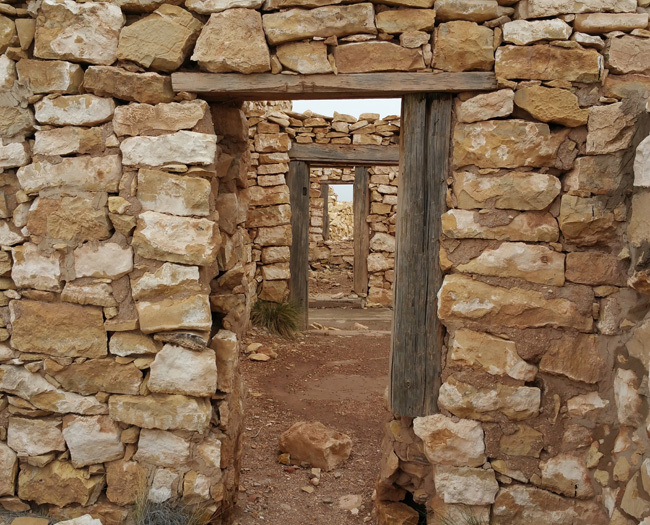 They've been cut in so many places, they do nothing to keep visitors out. A ravine cuts through the middle of town, crossed by a sturdy old bridge. 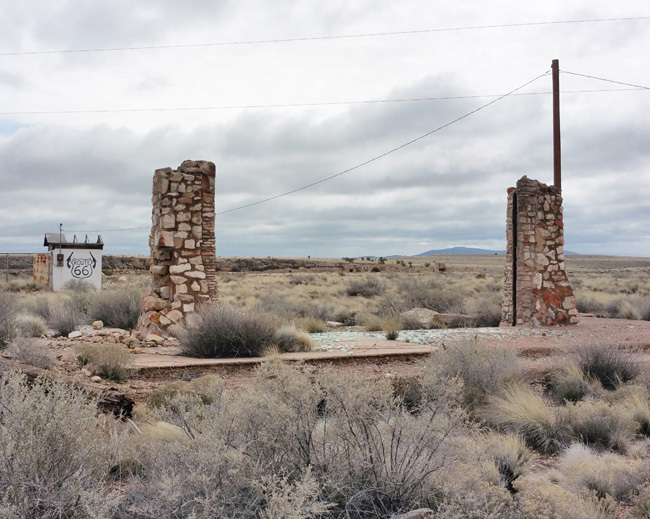 The unusual sprawl of ruins is due to the fact that Route 66 was realigned several times during the town's existence. Because Two Guns depended so heavily on traffic from the highway, structures were moved or rebuilt to follow each new alignment. 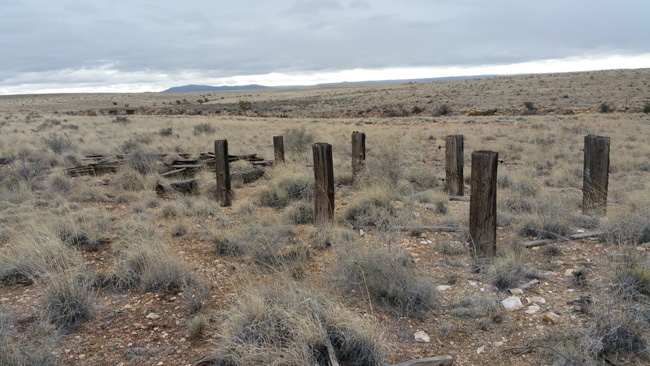 Near the entrance, two stone pillars and a bunch of broken glass stand before the foundation of a gas station that no longer exists. 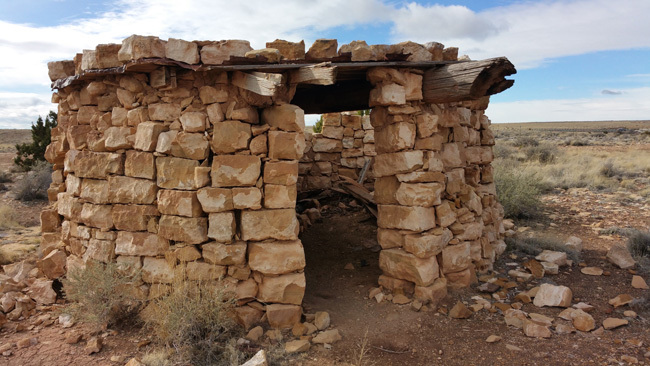 In 1922, Earle Cundiff, an army veteran from Arkansas who had served in WWI, and his wife Louise built a trading post where the Old Trails Highway crossed the Little Colorado River. Their operation expanded to include a restaurant, a gas station, and rental cottages. Consumer automobiles were becoming more popular and their business became an important stop along the transcontinental highway. 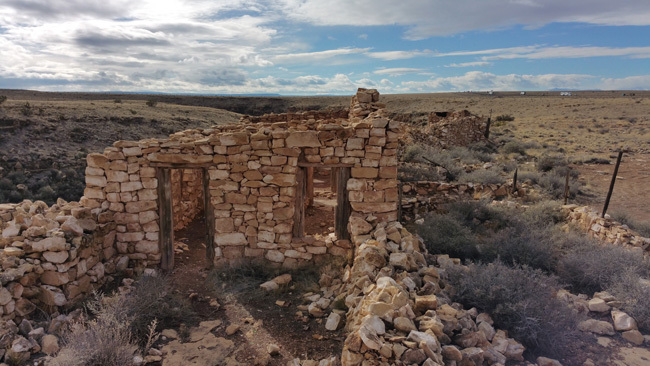 The Cundiffs leased out some of their land, entering into a 10-year agreement with Henry “Indian” Miller, a man who falsely claimed to be an Apache chief by the name of Chief Crazy Thunder. The guy had good business sense, but was apparently quite a scoundrel. 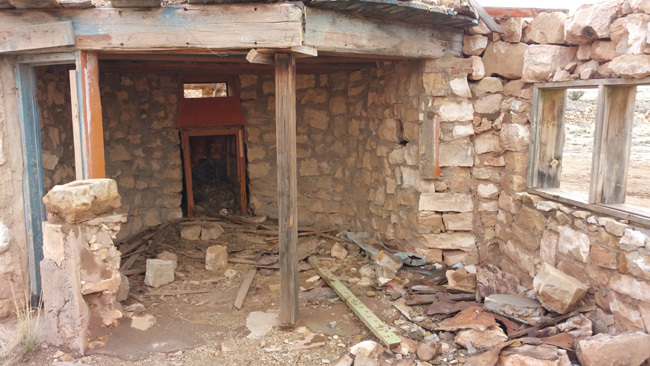 Miller hired Hopi to build false stone ruins just above Apache Death Cave, which he turned into a tourist trap called “Mystery Cave”. He even sold the skulls and bones of the dead Apaches as souvenirs. 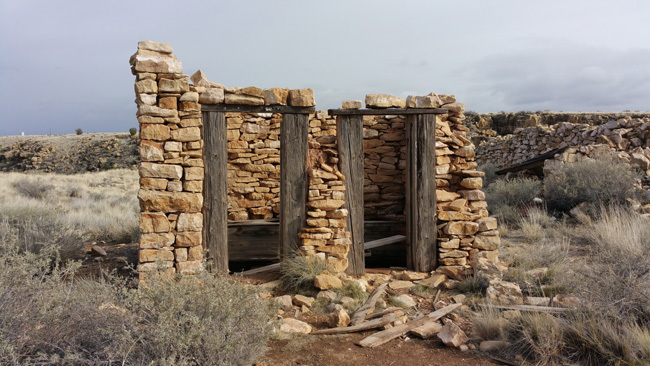 He also had them build a long stone structure he named Fort Two Guns. It included a zoo, gift shop, living quarters. Miller's zoo included bobcats, snakes, porcupines, and mountain lions. 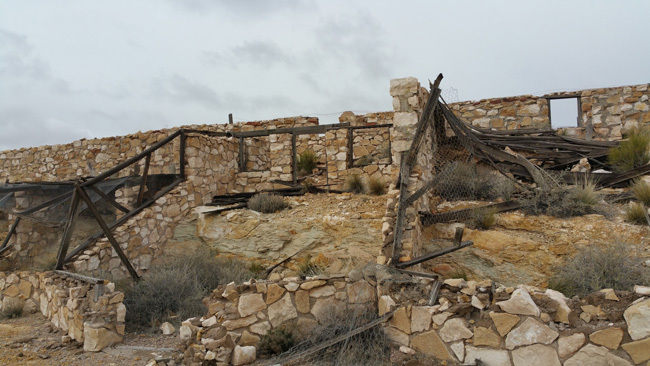 Two Guns ended became the unofficial name of the entire settlement, even though the post office rejected the name, instead calling it Canyon Lodge. The Cundiffs were apparently not very good judges of character because they leased their store to a couple who ended up stealing most of their merchandise. 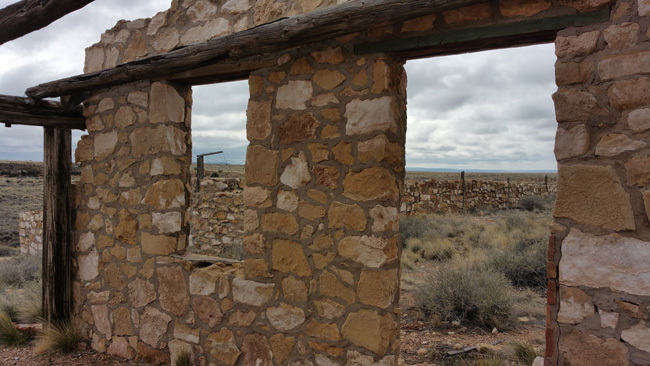 Then on March 3, 1926 after an argument over the terms of his lease, Miller murdered Earle Cundiff. Strangely, he was acquitted and returned to Two Guns. His zoo animals apparently had a sense of justice because he was attacked on three separate occasions by his mountain lion, lynx, and gila monster. From the latter, he developed a nasty infection in his arm that took six months to heal. He ended up in a court struggle after someone removed the advertising signs he had posted along the highway. After more legal trouble in 1930, he finally left Two Guns for good. 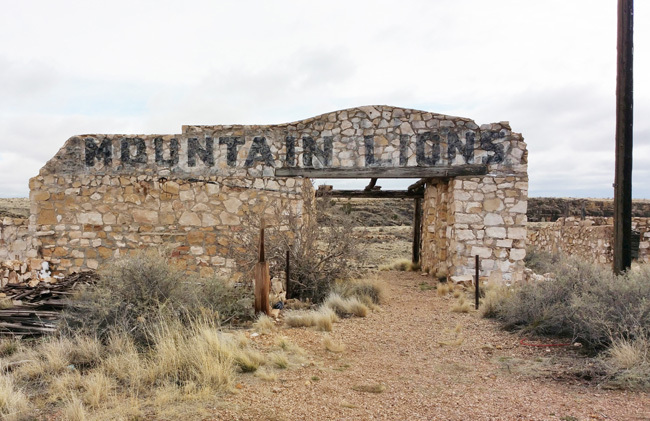 After Route 66 was rerouted in 1938, Louise Cundiff and her new husband rebuilt the town. In 1950 they sold Two Guns, and it entered a decade of decline. Ben Dreher bought the property in 1960 and revitalized it. He added a new motel, restaurant, gift shop, tavern, and service station. Keeping with the town's tradition, he had a new zoo built. 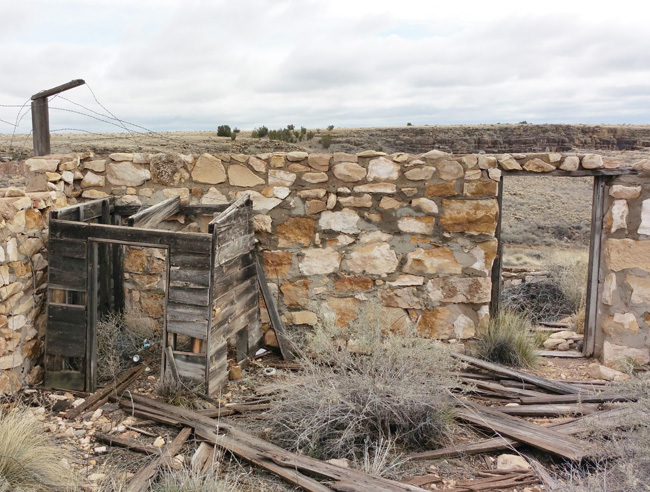 The ruins of Cundiff and Miller's stone buildings were restored and visitors could take guided tours through the ruins of the town's older sections. When plans for the new interstate were drawn up, Two Guns was given its own exit. With everything going so well, it seemed Dreher was immune to the curse of Two Guns. 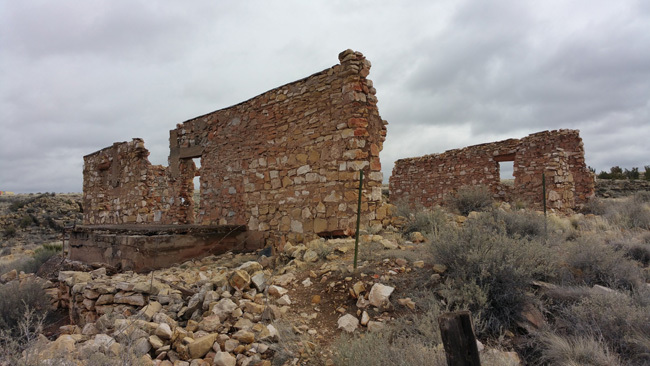 Then in 1971, just as I-40 was nearing completion a huge fire destroyed the town. 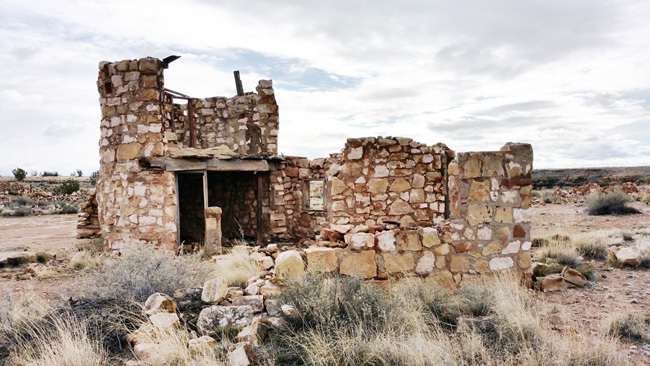 In 1992 entrepreneur Howard Armstrong purchased the land, intending to restore it to the tourist attraction it had once been. His plans never came to fruition, and in 1995 he had a stroke. Jimmy Solinger, the last caretaker of Two Guns lived in a trailer onsite, but had died several years before my visit. He was said to be very strict about keeping trespassers out. Considering the rampant vandalism of the abandoned campground next door, I couldn't have blamed him. He committed suicide in 2000, another tragedy to add to the town's dark history. There were rumors that Russell Crowe bought Two Guns in 2011 with the intention of filming a movie there, but it seems there was no truth to them. I spent a few hours at Two Guns and was the only person there pretty much the whole time. At one point a car pulled up and a guy got out to take a few pictures, but he disappeared pretty quickly. I think he left when saw my car and assumed it belonged to the property’s caretaker. 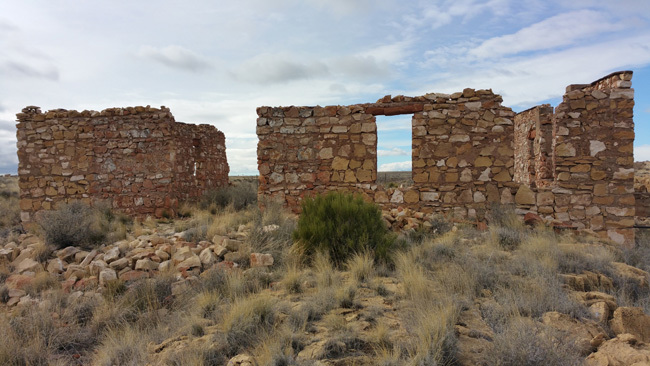 After exploring the ghost town I headed over to the campground. Just outside it stood another abandoned gas station. 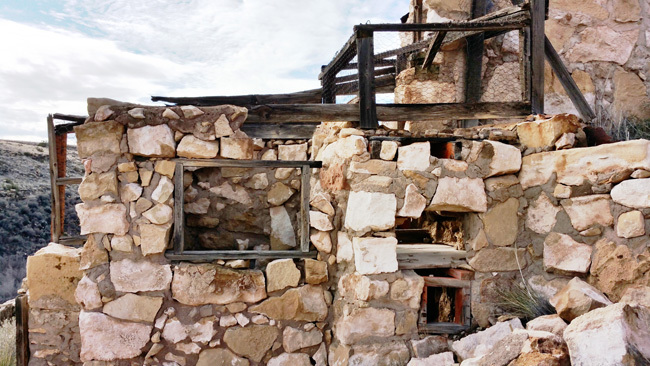 Unlike the others, this one was not built of stone, and has remained structurally intact. 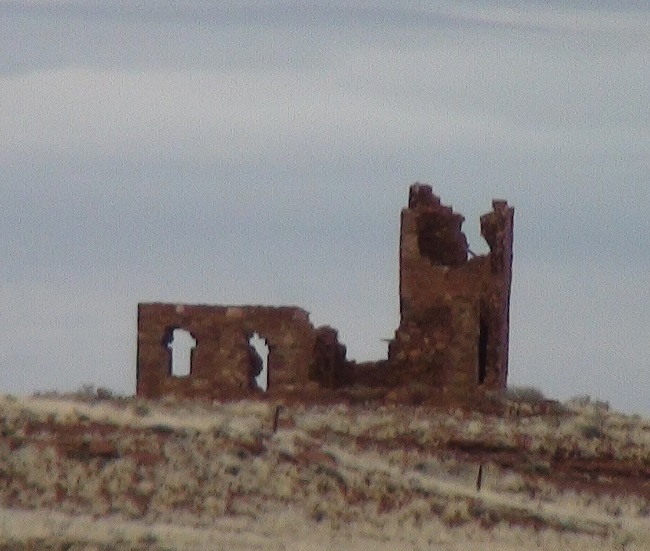 Behind it was the collapsing skeleton of another structure. I drove in, past two tanks painted with faded cartoonish characters. It was pretty obvious that the campground had been closed for quite a few years. The campsites were overgrown, their fixtures rusty and weathered. The several buildings on the grounds were totally tagged up and ransacked. 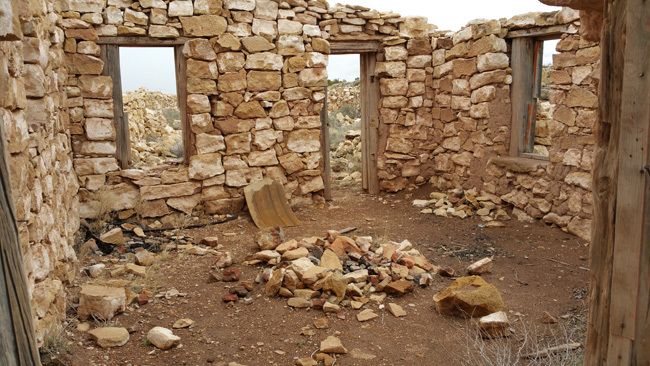 I’m glad the vandals didn’t do the same to the actual ghost town. By the time I left Two Guns, there wasn't much daylight left. 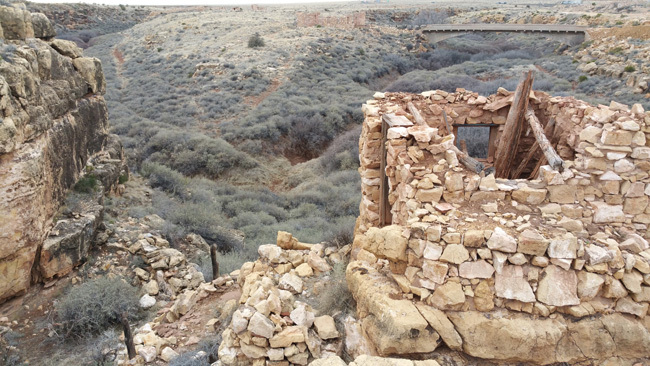 I headed East to check out the remains of a meteor crater observatory located on a stretch of Historic Route 66. I was disappointed to find the road gated off and marked with no trespassing signs. 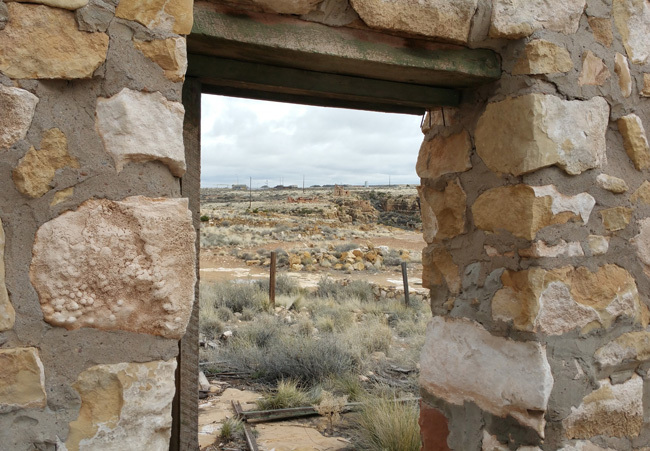 I considered walking the half-mile to the structure, but there were too many people at the nearby RV park/gas station and no cover along the road, so I decided not to risk it. I stopped at the RV parking place near a meteor crater, but the guy behind the counter was charging $30 per night, even though I was driving an SUV and wouldn’t be using the power or water hookups. I was irked by his inflexibility, but not terribly surprised. After sundown it was freezing outside. I spent the night at a rest stop east of Flagstaff. In the end I was satisfied enough with the rest stop with its heated bathrooms. I even got spotty 3G reception on my phone. 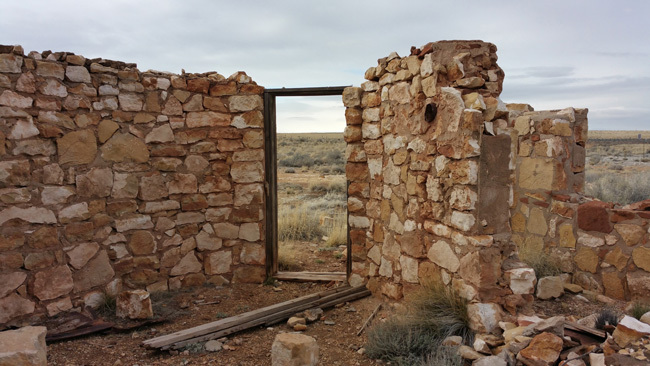 I wrapped myself up in blankets and got a few hours of fitful sleep before heading out to explore the ransacked remains of Meteor City Trading Post.